We fully understand that when your property has suffered fire and smoke damage, this can be a very traumatic time as your home no longer feels the same. Plus, if you have to move into temporary accommodation, this can introduce uncertainty and doubt. It is our aim to restore your home to pre-fire condition with as little additional disruption as possible and will focus our efforts on helping you to return your home as soon as possible. Unfortunately, fire damage results in a wide range of severity – from minor smoke damage to complete destruction of the building and its contents. At Cornerstone, we will ensure our technically competent teams carry out the necessary inspections to fully understand the extent of the damage and put together an immediate and timely plan of the restoration process to ensure the work is undertaken as quickly as possible. Our goal is to restore your property to its pre-fire condition as quickly as possible. We give our customers precise time schedules for the duration of the entire process. We take appropriate measures to look after your items, we will store unaffected and specially cleaned items off-site until the structure is ready. We will do everything in our power to minimise the loss items such as furniture, artwork and documents etc. Ensuring the safety of the residents is of the utmost importance to us. We will assess the condition of your property and take appropriate measures. Open lines of communication are the key to our recovery process. We have dedicated claims managers who update our clients at every step of the recovery process. From initial assessments to completion, you will always be up to date on what is happening. We willnot enter the property without the consent and instructions that the property is safe from the local authorities. Structural damage can be caused by fires and it is imperative that you do not enter the property without a structural assessment. If you do have consent to enter the property, please be aware of your surroundings and wear protective clothing. 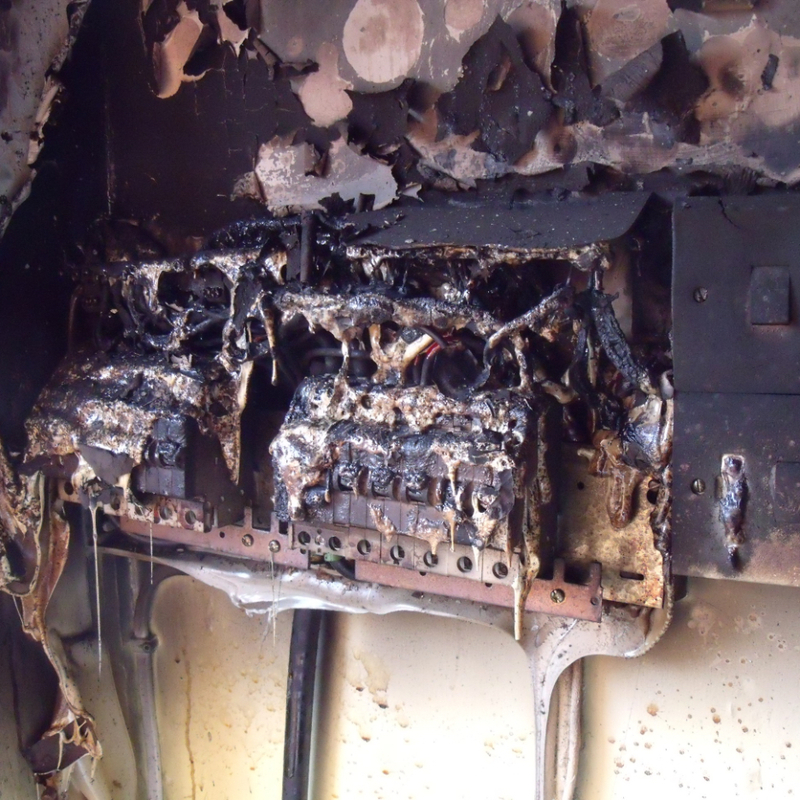 A fire-damaged property is at a high risk of having electrical system problems. We recommend you have your electrics checked at the first possible opportunity by a qualified expert. 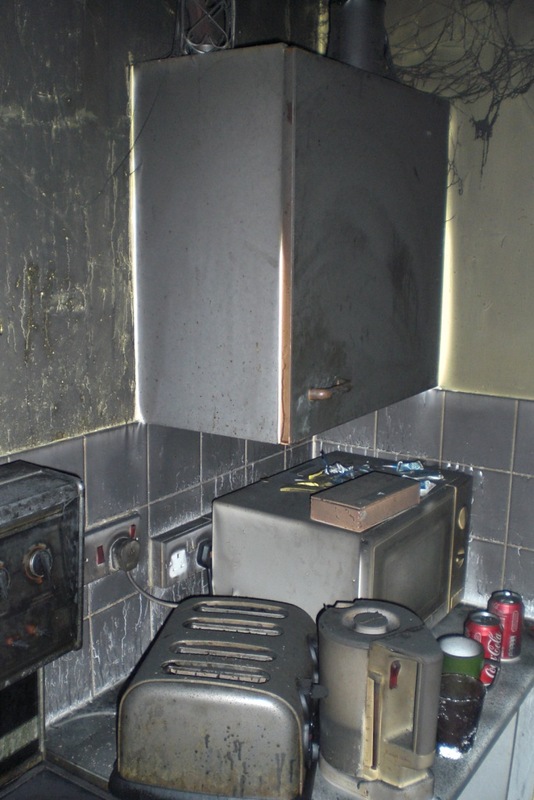 Failure to assess the system and take any necessary actions to make the system safe, could result in a secondary fire. When a fire occurs, many chemicals are released into the atmosphere. These chemicals are extremely dangerous and will be absorbed into your lungs. 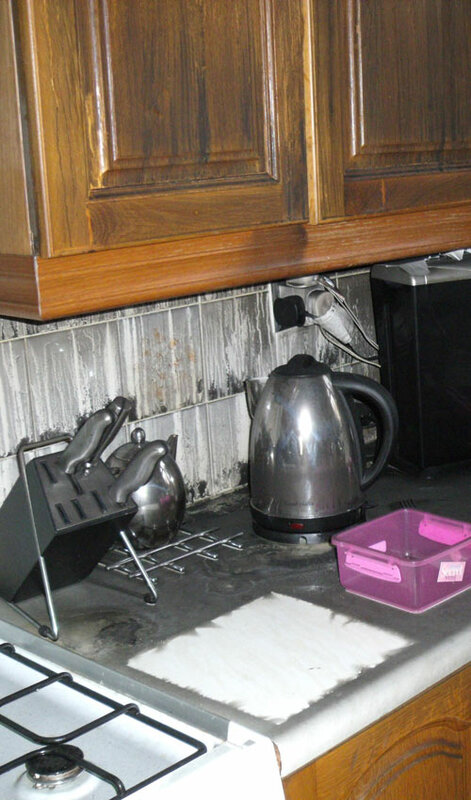 Fire damage requires specialist early attention to minimise the damage impact. The result of the fire and release of chemicals is the soot (where particles have settled) and the smell (where particles remain in the air and in fabrics), and these are likely to have travelled throughout the property and will now reside in any cracks and crevices. Our restoration service is professional, reliable and personal. Other services we offer also include Leak Detection Services, Damp Investigations and Specialist Drying. We provide a report for restoration or replacement with associated costs for damaged structural and contents materials based on the surface conditions, post-fire conditions and any pre-existing conditions. This assessment will contain information regarding personal contents deemed BER (beyond economical repair) but wanted by the homeowner. We will derive a plan how the building and / or content can best be restored, how long it will take and will give you a breakdown of the costs. All the decisions we make are based on minimizing the impact on you the occupant’s lives and we will have clear channels of communication. The clean-up process will include noting, listing and disposing of any items are deemed beyond economical repair. We work with the homeowner to identify contents and personal items that you wish to keep. We will then remove these items and will clean and securely store these items until the structure is ready. We have a methodical approach and will decontamise the property to minimise any potential health risks. Secondary damage such as smoke and soot are bi-products and we will take appropriate measures to prevent the deterioration and further damage to the property. The key objective is to successfully clean the property and to restore the structure to pre-fire conditions. Smoke penetrates into cavities and this is why we will also focus on eliminating any lingering odours from the structure. Odour elimination is an ongoing process undertaken throughout the property and, in many cases, specialist treatments are required to achieve a successful outcome. If you would like more information regarding our Fire restoration service please get in touch with our expert team today.